It's a well-known fact that cats and dogs don't get always along—except when they're pictured on Pals Socks. The company's socks combine unlikely characters to show that it's what makes you different that makes for a great friendship. 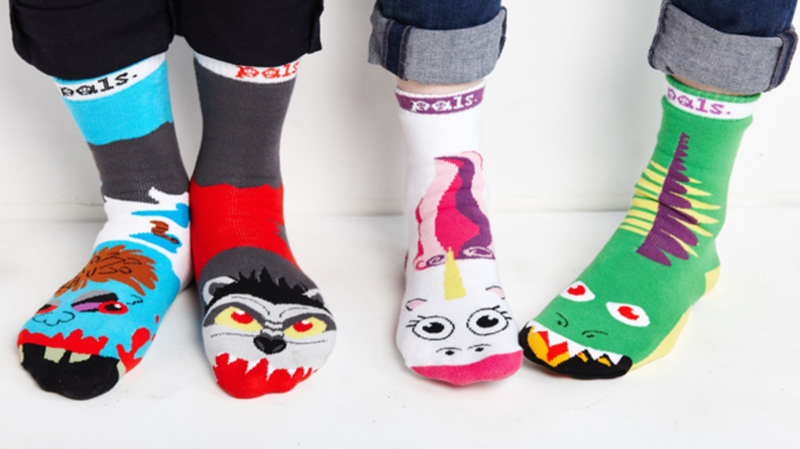 "Pals socks reminds us that the coolest way to be is to be yourself, and despite our differences, we can all be friends," their website explains. "Pals are much more than colorful mismatched socks – they’re a way of thinking, of promoting harmony. Kids are really our future, and we want to help them grow into empathetic human beings… one foot at a time." The unlikely duos include a cat and dog, a unicorn and dragon, and a lion and zebra. The pairings are meant to start a dialog with kids about being open with who they become friends with. Their socks come in sizes for all ages. Each pair costs $9, or you can make your own custom gift box of three pairs for $25. A portion of the company's profits are donated to charity. The best part is that when one sock gets lost, the other can be paired with a new pal. You can view all the options here.